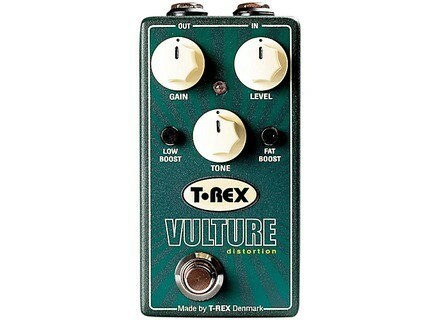 Vulture, Distortion from T-Rex Engineering. 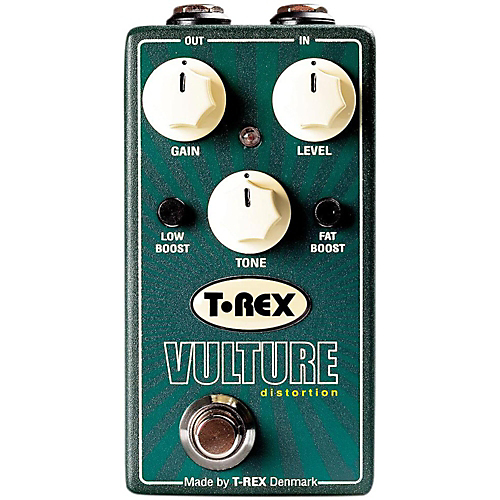 T-Rex has unveiled a new distortion pedal at NAMM 2014 that goes by the name of Vulture. After hooking you up with your SoulMate at NAMM, T-Rex Engineering has now decided to make prey of you with its brand-new Vulture distortion pedal. Vulture features simple controls to provide what the manufacturer describes as a tight, throaty distortion with lows and mids that can be shaped in many ways with the Low and Fat boost knobs. The pedal further features Gain, Level and Tone controls. According to T-Rex, the secret to the Vulture is to adjust the boost and tone knobs once the gain is adjusted to get an optimal sound and to avoid the Vulture from preying on your amp. The pedal runs on a 9V battery or external power supply. For more info, visit www.t-rex-effects.com. [NAMM][VIDEO] Atomic/Studio Devil Amplifire When a modeling genius meets a guitar amp champion, the result is Amplifire, a new guitar modeling pedal that we discover at NAMM 2014. [NAMM] Tech21 introduces Fly Rig 5 pedalboard Tech21 recently introduced at the NAMM Show 2014 a new pedalboard with 5 effects, including SansAmp. [NAMM] Rickenbacker intoduces W Series The new Rickenbacker W series presented at NAMM 2014 is a spin on the classic 330, 360 and 4003 models — made of walnut.